What is the Most Common Termite in Jacksonville? Termites are a problem throughout the United States, but they tend to be especially problematic in Florida. Termites love warmth, rainfall, moist soil, and other climate conditions that are especially common in the Jacksonville area. In fact, Florida is considered the state most at risk for termite damage, and Jacksonville is one of the cities that leads the way. It is because of that risk that it is so important for homeowners to be on the lookout for signs of termites. We at Bug-Man Pest Control also offer inspections, which are a good idea at least once every year to protect against termite invasions, especially since many of the signs of termites can go unnoticed. If you’d like to schedule a termite inspection in Jacksonville, FL, call us at 904-299-8552. What Termites Affect Jacksonville the Most? Although not yet in Jacksonville, Florida is also home to so many different species of termites that there are now hybrid termites - termites that have mated with other species of termites to create more destructive colonies. The Formosan/Asian subterranean termite hybrid is considered a "Super Colony" by some for its ability to breed and feed quickly. 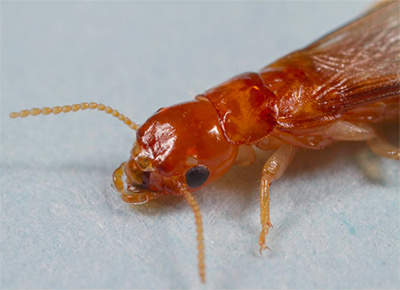 Eastern Subterranean Termites are the most common type of termite in the United States, and it is not surprising that they also lead the way here in Florida. But the drywood termite may come as a surprise. These types of termites neither breed as quickly nor feed as quickly, but unlike most other termites, they live inside of the wood itself and leave limited visible damage to the home, which means that infestations can go for years without being discovered. No matter what species of termite has infested your home, the damage they do can cost you up to tens of thousands of dollars. That is why it is so important to consider a termite treatment right away, along with regular inspections to ensure that you are not hosting any drywood termites or subterranean termites within your walls. For more information, or to schedule an appointment with Jacksonville’s fumigation and leading termite control service, please call Bug-Man Pest Control today at 904-299-8552. We offer fast response tent fumigation, termite warranties, soil termite treatments. Contact us today for more information.